Giovanna Imperia is a self-taught kumista. She began braiding in the early 90’s after she purchased a book written by Rodrick Owen. That led her to more books written by Makiko Tada and Jacqui Carey, a book on how to use the ayatakedai by Makiko’s mother and then to actual workshops with the braiding greats and a trip to Japan to study with Makiko. She is proficient on the marudai, takudai, karakumidai, ayatakedai and kakudai. Giovanna has a thriving business focused on unusual and, no doubt, hard-to-find textiles, and fibers. She calls her store “An Exclusive Yarn Boutique.” Window-shopping her website is an experience filled with color and beauty! This website is worth a visit! 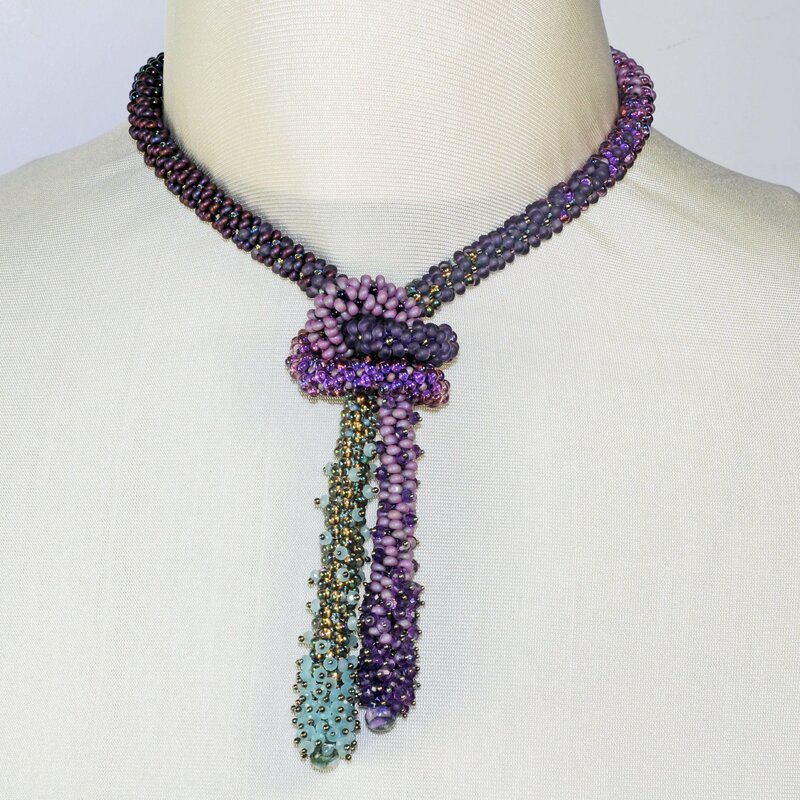 In addition to kumihimo, Giovanna spends her time weaving, knitting, and working with metal. She is currently learning the fine art of lacemaking. She has written one book Kumihimo Wire Jewelry and a monograph, written in Italian, on the history of Kumihimo. Her normal teaching schedule is 4-6 times per year, which leaves her time to create, find new yarns, and run her business. Giovanna Imperia returns to the Gathering 2018 with three exciting classes. Two are focused on technique and the third is project-oriented In One Braid…Many Designs, students will learn how the appearance of a kongoh braid can be changed simply by changing how the threads are organized, or by using different materials. In Compound Braids, students will combine two braid structures to create a completely different look. Giovanna says “ There are only a finite number of moves that can be executed on the marudai. Braids are created by repeating these moves over and over, by mixing moves or by changing sequences of moves.” She compares the process to knitting and to all of the various knitting stitches. “In knitting, you only have two stitches – knit and purl. Designs are created by how you execute these basic stitches and how you sequence them (knit from the front, knit from the back, knit two together, one knit one purl, and so on). These are the concepts that will be explored.” Both workshops use fiber; however, alternative materials such as thermoplastic, polyurethane coated yarns, metallics, micro chains and other materials can be used and will be available to students. The third workshop is project oriented. Students will pick an appropriate structure and braid a lariat that includes dangling felted balls. Giovanna will discuss the size to weight ratio when adding felted balls, beads or other dangling elements. Is It Kumihimo if it didn’t come from Japan?